It’s been a little over a week since the grand opening of The Wizarding World of Harry Potter – Diagon Alley, and Universal Studios Florida‘s blockbuster new attraction continues to attract astoundingly oversized crowds. While you won’t find the massive queue clogging park walkways that accompanied the opening of the original Wizarding World in Islands of Adventure, thanks to greatly improved crowd control procedures, guests are still waiting upwards of 5 hours on a daily basis just to Escape from Gringotts. While the new “multidimensional” thrill machine is certainly a marvel, we here at Touring Plans are congenitally allergic to advising any of our readers to invest half their vacation day in any one attraction, at the expense of experiencing everything else that Universal has to offer. In that spirt, we offer our newly updated Wizarding World of Harry Potter Diagon Alley Touring Plans, along with a comprehensive commentary with everything you need to know in order to open your magical bank account with a bare minimum (relatively speaking) of waiting. The following Diagon Alley touring plans are based on first-hand observations conducted during pre-opening media previews, soft openings, and daily operations during grand opening week. The plans were optimized based on a peak day (9.5 out of 10 on our crowd calendar) and may need modification once off-season arrives with shorter hours. As operational patterns evolve, we’ll continue to update our plans for maximum efficiency. These plans will also shortly be available as premium plans on TouringPlans.com and in our Lines app, so subscribers will be able to copy and edit them at will. Be aware that our system is not yet able to properly account for the queuing and return time tickets required to enter Diagon Alley, and may therefore return inappropriate results for that area’s attractions; for the moment, we recommend editing the attraction order manually through our website, and using “evaluate” instead of “optimize” for Diagon Alley plans. On most days, there is no wait to access The Wizarding World of Harry Potter — Hogsmeade. Guests can enter at will through either The Lost Continent or Jurassic Park. Near the Discovery Center in Jurassic Park, in the old queue for the former Triceratops Trail attraction, you’ll find a bank of touchscreen kiosks used to dispense return time tickets. Select the number of guests in your party (up to 9) and pick from one of the two offered hour-long return time windows, typically starting 2 hours apart (e.g., “10:00 a.m. to 11:00 a.m. or 12:00 p.m. to 1:00 p.m.”) The machine dispenses a ticket (resembling Walt Disney World’s old paper FastPasses) with your return time printed on it. Return to the Lost Continent entrance into Hogsmeade at the appointed time, and you typically will be admitted with little delay. Note that (unlike FastPass) you do not need to scan an admission ticket to receive a time, and only one member of your party needs be present to retrieve a ticket. 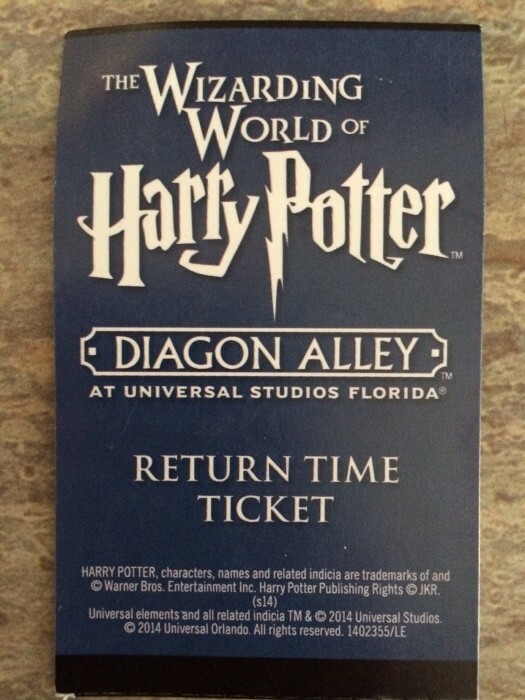 Sample return time ticket for The Wizarding World of Harry Potter. If guests do not wish to take a return time ticket, or all tickets have been distributed for the day, they can wait in a standby line that is established near the Jurassic Park Discovery Center. Because new guests are admitted to the Wizarding World only as others vacate, this line can move very slowly. The standby line is only offered on the most crowded days, and has not been needed during Diagon Alley’s debut season. On slow days, you may be enter the London area in front of Diagon Alley from either end without restriction, but those days are likely to be few and far between for the foreseeable future. Even after the initial surge of attendance dies down — which may take many weeks or months — on a day of average attendance we still expect you will experience at least a short wait before passing through the magical wall into Diagon Alley, even if arriving immediately after opening. At all but the slowest times, guests may only enter London via the gateway nearest Fear Factor Live, with the end closest to King’s Cross normally reserved for exiting guests only. On crowded days, the standby wait simply to enter the London area has been estimated at up to six hours in the mornings, with a queue (complete with snack vendors and giant screens showing the NBC “Making Of Diagon Alley” special in and endless loop) stretching backstage behind the MEN IN BLACK and Fear Factor Live attractions. Diagon Alley maximum capacity is reported to be as much as double that of Hogsmeade, but it will still fill up quickly even during times of moderate attendance. That is thanks in large part to the Early Entry offered for guests at all Universal onsite hotels (including the ginormous new Cabana Bay Beach Resort) as well as offsite guests purchasing special packages through Universal Vacations. USF park turnstiles open at least 90 minutes prior to official park opening. 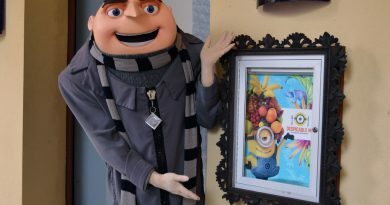 Early Entry guests are permitted to walk towards Despicable Me and held near Shrek. Day guests are directed down Hollywood and held near the Horror Makeup Show. Early Entry guests are walked through KidZone and Springfield towards MEN IN BLACK, then queued to enter the London area near Fear Factor Live. Guests are gradually released into London, with the first guests entering Diagon Alley and queuing for Gringotts just as the early entry hour begins. The last of the Early Entry guests to arrive may not enter Diagon Alley until the hour is almost over. Around the official opening time, day guests are walked through KidZone and Springfield towards MEN IN BLACK, and queued near Fear Factor live behind any remaining Early Entry guests. As the queue grows throughout the morning, arriving guests may be directed to join it through backstage gates between MEN IN BLACK and Fear Factor Live, or MEN IN BLACK and The Simpsons Ride; look for employees holding large blue directional signs in the World Expo area. As soon as Diagon Alley reaches maximum capacity, which should be shortly after opening on peak days, the return time kiosks between MEN IN BLACK and Fear Factor Live will be activated. The kiosks operate identically to the ones described above, and there is rarely more than a minute wait to access them. 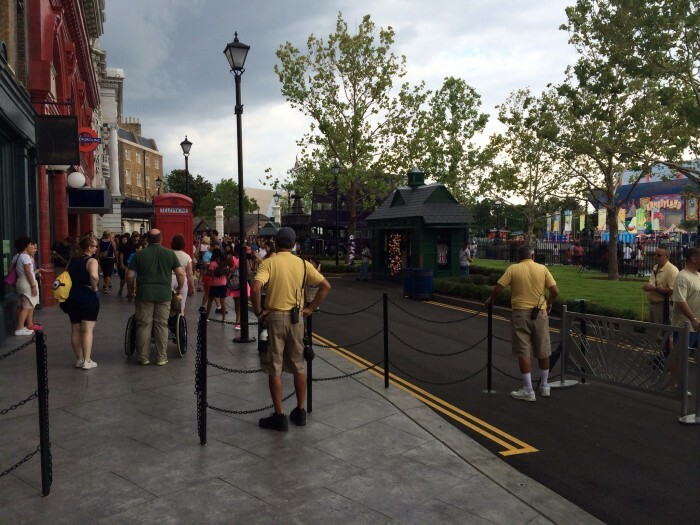 Guests with a valid return time ticket report directly to the gateway into the London Waterfront next to the Grimmauld Place facade, bypassing the standby queue near Fear Factor Live. Typically return ticket holders will then enter with no delay, but at certain times a return queue can stretch along the waterfront embankment towards King’s Cross station; don’t worry, it should move quickly. Even on the busiest days, return ticket distribution ceases in mid-afternoon, and the standby line dwindles shortly thereafter. On almost any day, you should be able to enter London unimpeded. For this reason, we strongly recommend that unless you can be among the first into Diagon Alley during early entry, save the area until the end of your day. It’s also important to note that if you exit the London area for any reason, you will have to rinse and repeat one of the previous procedures before reentering. …or you can follow our plan to wait until late afternoon and just waltz in. Most guests upon entering Diagon Alley will stop and stare at the fire-breathing dragon at the top of the street, then sprint towards it to jump in the line for Escape from Gringotts, the area’s signature E-Ticket. In the ride’s early days of operations, wait times have leapt to two hours within minutes of the Early Entry guests’ arrival, and risen to 300 or more minutes by mid-morning; on the busiest days, wait times up to 450 minutes (7 1/2 hours!!!) have been posted. These absurdly long waits reflect the intense popularity of the new attraction, which is more accessible than Forbidden Journey to guests unable or unwilling to brave more intense thrill rides, compounded by capacity limitations which should hopefully prove temporary. On opening day, the attraction was operating with only 3 vehicle trains, and a theoretical hourly capacity of only about 700 riders. A week later, the attraction was running 5 trains and moving almost 1000 guests per hour; eventually, it should be able to run 9 trains simultaneously for a healthy maximum hourly throughput of over 2000 riders. Be among the very first guests to arrive for Early Entry, and get in line for Gringotts as soon as the doors open. As long as you are among the first few hundred inside Diagon Alley, you should be in and out of Gringotts before Early Entry ends. Be warned that this plan can backfire if overnight maintenance issues delay the ride’s opening. If employees inform you that the ride is not yet running when Early Entry begins, don’t bother getting in the queue; instead, check back later in the day. If you are not eligible for Early Entry, or are eligible but unable to arrive at least an hour before it begins, don’t even bother with Diagon Alley until later in the day. Experience the rest of the park’s attractions, then visit Diagon Alley in the late afternoon, when you should be able to enter London without a standby wait or return ticket. The Gringotts queue tends to shorten starting around 5 p.m. Don’t wait too long, however, because if the total wait exceeds the operating hours remaining in the day, the Gringotts queue may close to new riders as early as 3 hours before park closing. A final trick for reducing your Gringotts wait is to use the “single rider queue,” which is typically about 25% of the standby wait. Note that the singles line bypasses all of the queue elements used to set up the story, including the preshow elevator simulation, and is therefore strongly discouraged for first-time riders. 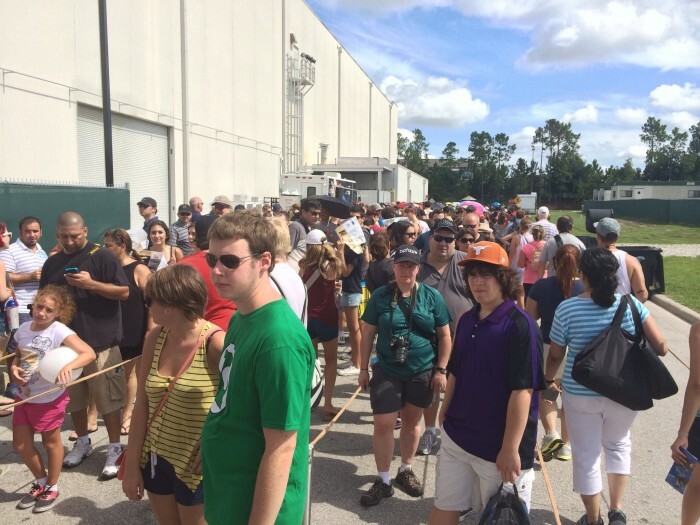 In addition, the singles line may be closed intermittently when it reaches maximum capacity; usually it reopens after a half hour or so, once the line has diminished. 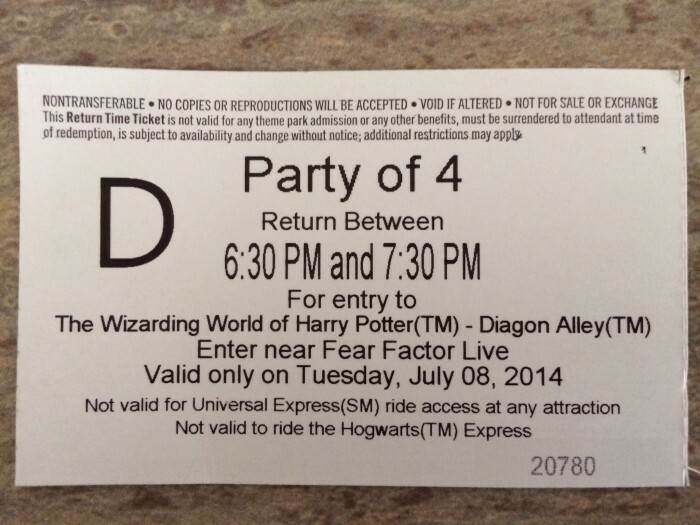 A park-to-park ticket or annual pass is mandatory to ride the Hogwarts Express. Guests with single-park tickets are able to upgrade their admission at ticket booths located at each train depot. All Hogwarts Express rides are one-way only. If you wish to return to the park you departed from, you will be required to exit the train station and re-queue before re-boarding. There is no minimum height requirement or safety restraints on the train, and personal strollers and motorized wheelchairs may be brought on board. Rental strollers must be dropped off and exchanged for new ones at the train station exit. At peak times, Universal has plans to restrict guests to one one-way train trip per day, with those wishing to re-ride consigned to a secondary queue with twice the wait of the standard line. However, wait times for the train have proved much lower than expected, so this re-ride policy has not yet been enforced. Most importantly, the Hogwarts Express loads and disembarks outside of the Wizarding World, and is not technically inside Hogsmeade or Diagon Alley. While the King’s Cross train station is part of the same London facade as the entrance to Diagon Alley, there is no direct access from the train to Diagon Alley (or vice versa). That means that guests wanting to ride the Hogwarts Express to Islands of Adventure do not have to first queue to enter Diagon Alley; there is a separate entrance through King’s Cross. Conversely, guests disembarking the train in King’s Cross will exit into the London area near the border with San Francisco, and need to get in line or retrieve a ticket if they wish to enter Diagon Alley. Likewise, on peak days if timed tickets are required to enter Hogsmeade, guests arriving at Hogsmeade Station will not be able to walk straight into the village without first waiting. In short, if you thought you’d be clever and get a jump on the crowds outside Diagon Alley by taking the train in from Hogsmeade, fuggedaboutit. On the other hand, if you have a park-to-park ticket and want to take the ride, but aren’t uber-passionate about Potter lore, the Hogsmeade side usually has noticeably shorter waits than the London station, which has the amazing wall walk-through photo-op at Platform 9 3/4 to slow the line. Because the Hogwarts Express rarely exceeds half an hour between mid-morning and mid-afternoon, we suggest park-to-park passholders take the trip any time after they have experienced the park’s other top attractions. However, we have noted that the wait times tend to rise as evening approaches, so don’t wait too late in the day before riding. Exit Rockit to the left towards New York and ride Revenge of the Mummy. After exiting the Mummy, walk towards the lagoon and follow it counter-clockwise to Springfield. Experience The Simpsons Ride. Turn right upon leaving The Simpsons and ride MEN IN BLACK. Cross the waterfront past London back to San Francisco and see Disaster! If you are on track you should be able to catch the first tour of the day. Exit Disaster! to the right and ride Transformers. Walk past Mel’s Drive-In and cut through the Garden of Allah villas to experience the E.T. Adventure. Retrace your steps and continue past Shrek to Despicable Me: Minion Mayhem. This will be a long wait, but it isn’t much better minutes after opening, and won’t drop significantly until closing time. Take a break for an early lunch. Fast Food Boulevard in Springfield is your best bet for counter-service, or try Finnegan’s in New York for a sit-down meal for not much more money. After lunch see the first Beetlejuice’s Graveyard Mashup of the day. Cross through New York and experience Twister. See the next available performances of Animal Actors and the Horror Makeup Show. Between the shows, see Shrek 4-D. Experience Terminator 2/3-D in Hollywood. 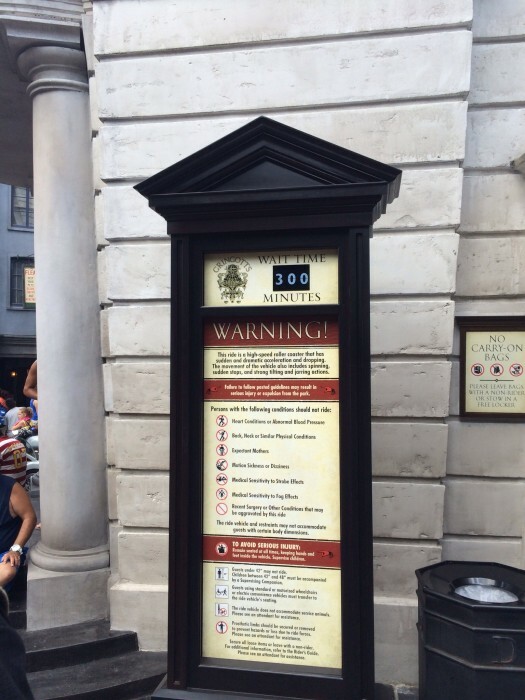 You should be able to complete the above steps between 4 p.m. and 5 p.m. At that point, you should be able to freely enter Diagon Alley without a wait. Return to Diagon Alley and explore the shops and sites, starting with Olivander’s Wand Shop, and wait for the show inside. The experience is virtually identical to the annex found in Hogsmeade, but there are three performance spaces so the line should moves at triple the pace; you should rarely wait more than 10 minutes for a show. After the show, purchase an interactive wand if you want to play with the magical effects hidden around the Wizarding World. Walk past Mel’s Drive-In and cut through the Gardens of Allah buildings to experience the E.T. Adventure. Visit Diagon Alley and explore the shops and sites, starting with Olivander’s Wand Shop, and wait for the show inside. The experience is virtually identical to the annex found in Hogsmeade, but there are three performance spaces so the line should moves at triple the pace; you should rarely wait more than 10 minutes for a show. After the show, purchase an interactive wand if you want to play with the magical effects hidden around the Wizarding World. Check back soon for the second part in this series, featuring our most frequently requested touring plans: comprehensive two-park plans covering the entire Wizarding World of Harry Potter! Thank you so much for this detailed article! Our whole trip at the end of August is based on riding the Hogwarts Express and buying wands. I did plan on sneaking into Diagon Alley via the train, so I have to re-think my strategy there, but I think my family will walk away satisfied. As long as I get to enjoy my Duff beer, I’ll be happy! 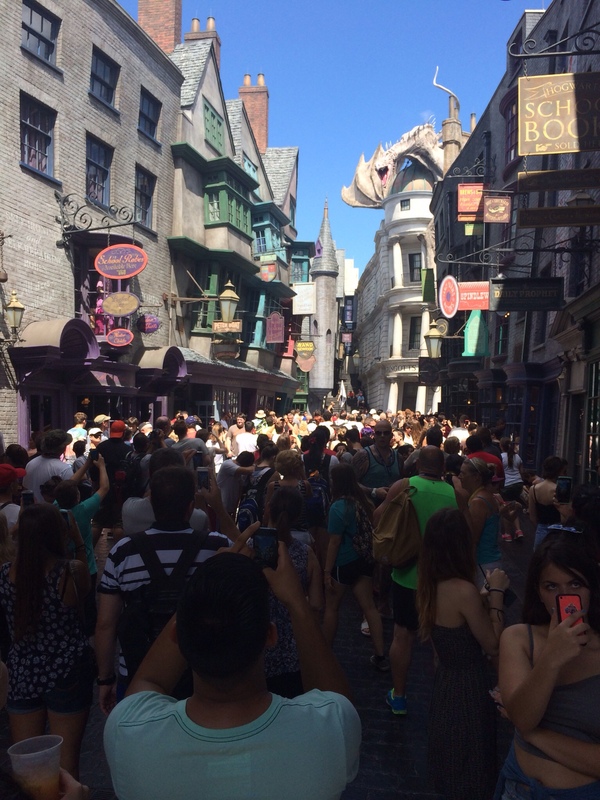 Seth thank you for posting your adventures in Diagon Alley! We are heading there the middle of Aug. hopefully the crowds will be lower by then. Our only must is grinotts and the Express! Between staying on property and this new plan I think we will be able to accomplish this. I can report that my non-EE visit to Diagon Alley went reasonably well on Monday, July 7. I got to the turnstiles just after 7:00 a.m., queued up with the other day guests near the makeup show, and finally made it to the Gringotts queue. The posted wait time there was 210 minutes (a bit better than I expected, actually.) However, the actual total wait time from entering the queue to exiting the ride building was about 150 minutes. Plus I was able to avoid the non-shaded portion of the queue entirely, no small consideration in July. 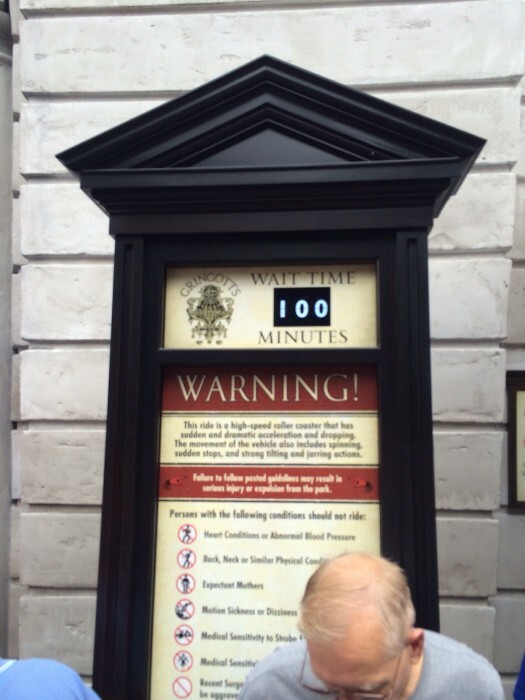 So if you lack the patience for the recommended late-afternoon approach to Gringotts, you might get lucky. Glad to hear you got so lucky Steve! What were the lines like in the rest of the park when you got out of Diagon? This plan is designed to let you see as much of the park as possible in 1 day, but if your #1 priority is seeing only Gringotts then go for it! PS Diagon Alley didn’t open until July 8. Did you mean to say Monday 7/14? Oops sorry, that should have said Monday, July *14*. My mental calendar isn’t working today. And yes, I suppose my main goal was seeing the DA attractions with other things taking low priority. After Gringotts I was able to eat at the Leaky Cauldron, followed by walking through Knockturn Alley, ice cream at Florean Fortescue’s, Gringotts Money Exchange, Ollivanders, and the HEx. None of the post-Gringotts attractions had any lines to speak of — I would say the longest was maybe 15 minutes. The snack shop inside the HEx queue was looking a bit forlorn, as there weren’t nearly enough people in line to stretch back there and people just walked on by. I do think that Park-to-park personalized touring plans should be possible to be made since the universal parks are so close and it’s very common people visit both parks n same visit! So so helpful!!! Thank you!!!! Thank you. Have enjoyed and appreciate all of your coverage of the opening. Can you do early entry on check in day of a one-night stay at one of the Universal hotels? Is the ride on each direction of the HE the same or different? If assuming different, which one is better? They are different, accounting for both queue and ride the King’s Cross end is better, but Potter fans will want to do both ways. In reading all this I still do not know whether it is worth trying to go the week of September 15, 2014. Will the rush have died down by then? I do not want to stand in lines for 5 hours. We have been there before but the new Harry Potter stuff has my 15 year old excited and I would like to make her happy. I got in line about 6:30pm the other day and only waited 90 minutes. There is no reason to wait 5 hours if you follow our plans, especially in September. times. We got early entry into park at about 0645 (on site hotel guest) The queue time when we left ride at 0850 wad 4 hours!